Aħna Refuġjati, a next-generation opera by Valletta 2018, will premiere today week, on Saturday 31st August at the Granaries in Floriana. The second performance will be held on Sunday 2nd September. More than 150 people are working on Aħna Refuġjati, which is now just one week away. Over 100 people will be on stage, including 10 main singers, a choir of 35 people, 8 acrobats and around 30 extras. Meanwhile, more than 50 people will be working behind the scenes. These include make-up artists, costume makers and stage crew, among others. Among the members of the cast are Miriam Gauci, José Hernández Pastor, Joseph Zammit, Clare Ghigo, Federica Falzon, Nico Darmanin, Ruth Sammut Casingena, Nadia Vella, Louis Andrew Cassar and Joseph Lia. The aim of this production is to promote thought and discussion, and to create a healthy dialogue about current issues which are often overlooked. Valletta 2018 firmly believes that art can be a catalyst in this process, and for this reason it always seeks to create opportunities that foster creative exchange against an artistic background. With a libretto written by Mario Philip Azzopardi, who is also the director of this production, Aħna Refuġjati recounts the challenges encountered by a Syrian family forced to leave home due to civil war, including crossing borders, lack of basic human rights, racism, separation and loss, on a trip motivated by hope for a better life away from war. From the unpleasant conditions in the refugee camp, hunger, loss, dispute, and even brief moments of love and happiness, this opera presents a broad spectrum of human emotions. With music by Mario Sammut and Richard Merill Brown, this opera will be a new audiovisual experience, as the sounds of 184 instrumentalists, that have been created virtually by Mario Sammut inside his studio thanks to cutting-edge musical technology, will provide a unique acoustic experience for the audience present at the Granaries. This use of electronic technology, which is frequently found in the world of cinematography, complements the more traditional orchestral style of Richard Merill Brown, who is also the musical director of the production. This makes Aħna Refuġjati a truly progressive opera. Although the opera is written and produced entirely in Maltese, surtitles in both English and Maltese will be shown, so that everyone can follow the action on stage. Valletta 2018 Chairman Jason Micallef said that Aħna Refuġjati is part of the opera season. He explained that recently there has been criticism regarding the subject tackled by the opera because the word ‘refugee’ is part of the title. He said that this production does not speak for or against, but talks about the situation, and therefore can convey both a message of compassion as well as an educational message. He said that he is pleased that UNHCR and MOAS have shown interest in the project. 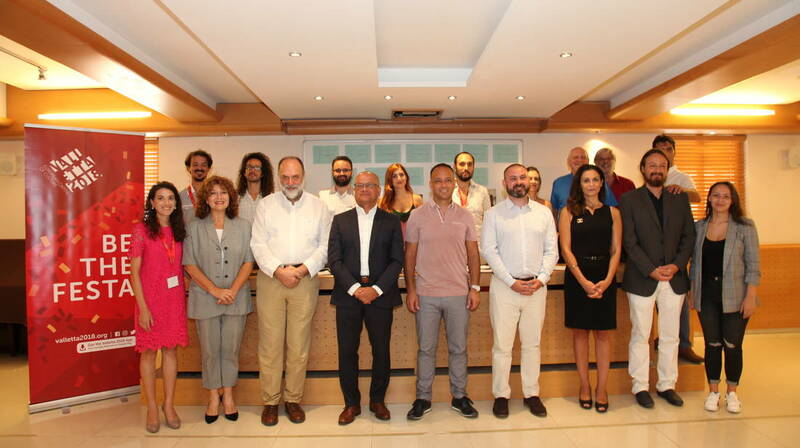 Minister for Justice, Culture and Local Government Owen Bonnici visited the cast and crew during rehersals, and described Aħna Refuġjati as an example of how art can serve as a medium of communication in a creative manner. “This Maltese opera is the first of its kind, and is proving once again our drive to invest in this sector to keep increasing on its accessibility and also to strengthen professionalisation in this ever-growing economic niche. Our aim is to always provide a varied artistic and cultural programme for everyone, to keep on promoting an inclusive culture, whilst providing a platform for our artists to keep on developing and strengthening their talents thanks to initiatives of this calibre,” stated Minister Bonnici. Parliamentary Secretary for Consumer Protection and Valletta 2018, Deo Debattista explained that this product of Maltese talent has a current theme, reflecting the European spirit. Get your tickets today from tickets.valletta2018.org and be in with the chance to win an iPhone X when using the promotional code VALIPHONEX at checkout. Terms and conditions apply. Aħna Refuġjati is organized by the Valletta 2018 Foundation, in collaboration with the Floriana Local Council, the Grand Harbor Regeneration Corporation, the Armed Forces of Malta, Transport Malta, and Mad About Video. The opera is part of the Valletta 2018 Cultural Programme.